I'm telling you all this to let you know this was not a hate read. I was wary of The Selection, but I think I went in with an open mind. And while I didn’t hate every second of the novel, it still wasn’t good. THESE TWO STATEMENTS ARE COMPLETELY AT ODDS WITH EACH OTHER. Uh, that leaves a LOT of ground to cover. It’s established that Fours and below are starving, (and they aren’t allowed birth control to keep them that way,) and Twos are basically Glitterati, (so we put soldiers there...why?) Where do doctors fall? Scientists? All of Maxon’s advisors? The people who own those shops and factories? Why are farmers and stablehands not Sevens? Why have/let women work if we’ve regressed to taking away their autonomy? It’s just not fleshed out at all. Not to mention what it would take for the US to give up and go to such an archaic system. (Or why Maxon’s last name is Schreave when he would be a direct male descendant of Illéa?) Additionally, during the wars, Europe banded together to fight off the Chinese. This is only illustrated in the fact that they now have a country named Swendway. I’m not trying to pick, but it’s just so distracting to be told that this is the future, the world is different, but none it feels realistic. The contest is silly, but fun. I can appreciate the idea of reality shows being taken so seriously that they become a legitimate form of government. When recreating the typical contestant arcs, (ultra mean girl who acts all sweet in front of the guy, jealousy over the first kiss/solo date/etc, girl here for the wrong reasons…,) I found the book to shine. Unfortunately, that takes up relatively little of the plot. There’s no elimination ceremony, so the herd is thinned in two large swaths. Eight of the thirty-five girls go on the second day, including one of the only three, (besides Mer,) to get character development. Relatively early, there’s a fight and a girl who’s sent home for speaking ill of America. Those are the only eliminations we see until the end. With no fanfare, with twenty pages left, the prince basically comes to dinner and says, “I’m cutting the field from 19 to 6. Sorry.” I wish they had included some more traditional dating show elements. Challenges, group dates, more interaction between the girls. Frankly, Maxon picking America was obvious from the first day and her insecurities about it started to grate. If they’d shown more of the other girls, maybe I would have felt more of a reason for her being upset. America and Maxon the couple brings me to the worst part of the book. That being the absolutely awful love triangle. If I have to pick a team, I’ll go with the guy who did NOT say, “and if you love me, you’ll do this…” The one who didn’t say, “I’m not some charity case, America. I’m a man. I’m supposed to be a provider.” I’ll go with the one who didn’t break into her room and didn’t risk her life for kisses. Not that Maxon’s a great choice, but Aspen’s a terrible one. His showing up honestly kind of ruined the book for me. I was starting to get into the Selection contest, starting to think I was being too hard on the writing and the world building, and then, boom, her ex-boyfriend is drafted, assigned to the palace, and assigned specifically to America’s guard detail so we can get lots of angsty internal monologues about how she still loves him. Gag me. And the end, which basically amounts to Mer spending time with both guys, deciding she doesn’t have to decide now, (um the government says you do,) and...to be continued! No climax. I suppose it did make me want to read the second book, if only for a little resolution. 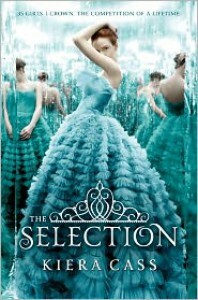 The Selection seems like a book people love or hate depending on their ability and inclination to suspend disbelief, and I like to think I can generally overlook a lot of issues for a fun premise. Unfortunately, maybe because I just read a far better dystopian dealing with class and caste issues, (Pawn,) but this time, I could not. Lazy writing, sloppy worldbuilding, and offensively transparent plotting drug down what could have been an interesting commentary on entertainment culture. Instead it reads almost like a contemporary romance instead of a dystopian fantasy. And that’s not what I want.